For 10 days in late September and early October each year the Okanagan Valley comes alive with a celebration of the grape harvest. This is the only wine festival in North America held during harvest with over a hundred events taking place around the valley from vineyard tours to winemaker’s dinners, iron chef cook offs and educational seminars. The Okanagan Fall Wine Festival is ranked among the top 100 events in North America and it is right in our backyard. So book early, plan ahead and take in some of the great food, extraordinary locations, amazing wine, music and people the Okanagan celebrates each fall. This year's festival kicks off September 28th and runs until October 7th. Pick your weekend or weekday, visit and celebrate with the people who make the delicious BC wines you enjoy all year long. A new event this year is Alexis de Portneuf, The Young Chefs on October 4, 2012 at Infusions Restaurant, Okanagan College. The final weekend wraps up with the Valley First Grand Finale Consumer Tastings October 5 & 6, 6:00 pm at the Penticton Trade and Convention Centre. Blue Mountain Vineyard and Cellars is pleased to participate in a wine dinner, October 4, 2012 at the Harvest Golf Club 6:30 pm. This is a great opportunity to savour the flavours of the elite wines from Blue Mountain. Treat your senses with a locally inspired five course culinary creation from Executive Chef Dan Werry and his culinary team paired with Blue Mountain wines. Live musical entertainment. Reservations required. In June the Euro Cup was held in Poland and the Ukraine. You wouldn’t think this is a big deal to a bunch of Canadians who didn’t even qualify, but here at Blue Mountain Vineyards it was. This year we have 3 staff members from Germany and one from Poland. I myself have a British/Dutch heritage so soccer or football as they call it in Europe was very much a part of growing up. Needless to say the discussions around the lunch table and the interaction between the guys in the cellar and the office staff were pretty focused on the games. It made it kind of fun to all unite around a common subject. Sport. Sadly none of our teams won but we enjoyed giving each other a hard time and commiserating when our teams were eliminated. Two of our Euro Contingent are permanent staff. Tomasz from Poland who does restaurant and retail sales in the Okanagan as well as helping in the office and tasting room and doing a lot of packing. Felix is also here on a more permanent basis as well and makes up part of the German trio. 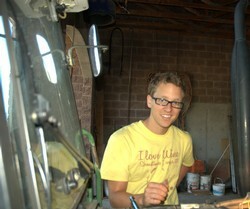 Felix assists Matt with the winemaking and Christoph and Christine are here on internships until the end of harvest. Christoph is working in the cellar and the vineyard and Christine is helping us in the office and the tasting room. As part of our conversations I thought it might be interesting to get to know these Euro staffers a little better and so I asked them a few questions. Here is what they had to say. Tomasz: I first got introduced to red wine back in Poland, around 12 - 13 years ago. At that time there was almost nothing available so when I arrived in Canada 10 years ago I was pleasantly surprised to see all the wine from around the world. Christine: I was raised on my parents wine estate so I became familiar with working in the vineyard and cellar. I also represented my village as a wine princess and decided to study International Wine Business. Felix: My grandpa and uncle farm vineyards in Germany. As a little boy I already helped out in the vineyards. Christoph: Grew up in a traditional wine region and worked at my parent’s winery. Tomasz: I haven’t seen that many places, but I think I like the border of Spain and France. Christine: There are lots of great wine growing regions and to my mind each is individual and fascinating. There are nice regions in Germany like Pfalz (palatinate), Baden especially the Lake Constance area and the Douro Valley in Portugal and of course the Okanagan Valley. Felix: The Pfalz in Germany. The second largest wine region with 23,000 ha and the most beautiful. The world’s best Rieslings come from there. Tomasz: Chardonnay because it is so beautiful and so underrated nowadays. 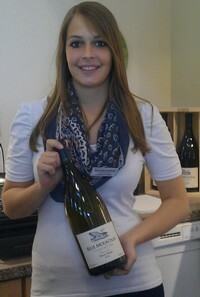 Christine: I really like Riesling because this grape is so changeable. This means that you can produce brilliant dry wines which can be fruity or have mineral qualities, on the other hand it is possible to create great sweet and noble sweet wines. Riesling has great flavours of green apple, peach, grapefruit and a high acidity which leads to a fresh wine. Christoph: Riesling - There are many different styles and types are possible. Typical for Germany you can find it anywhere in Germany. Felix: Definitely Riesling. No other variety is so versatile and expresses the terroir like Riesling does. Tomasz: Once the summer arrives, there is no better place to be in the world. First class outdoor activities, mountains, wine, lakes...everything is here. Christine: Friendly people and customers, beautiful landscapes and nice weather. Christoph:The friendly, helpful and relaxed people. Felix: Meeting new and interesting people. Beautiful landscape and good wine. Tomasz: Homemade perogies and white borsch over smoked sausage. Christine: German breakfast, driving without a speed limit. Felix: Beer, sausage and sauerkraut and my girlfriend of course. Christine: To get an insight into the Canadian way of producing and selling wine and the wine market. To get to know some new wines with a different style. Christoph: How to produce high quality wines and how to manage all of the important sequences of work. Also to improve my English. Felix: To make good wine, getting more independent and more experience. To gain insight into a successful run winery. So if you see them in the tasting room or out on a tractor say hi or give them a wave. They are happy to share their experiences and talk with visitors. Thank you to all of our Euro connection for being such great sports. I am sure we will learn as much from them as they are learning with their Canadian experience. Hopefully their time here will leave them with a soft spot in their hearts for Canada in the future. Go Canada go! Food and wine pairing can be complicated. It takes lots of practice and if you get it wrong it can be mediocre at best. If you get it right the experience can be magical. There are lots of excellent food pairings that have a history of going well together. Things like Sauvignon Blanc and Goat Cheese, Pinot Noir and Duck or Wild Mushroom Risotto, Pinot Gris and Oysters. Here is an easy one to get you started on your road to food and wine pairing success and to wow your friends or family the next time you are hosting an event! Makes a great light starter especially if people are arriving at different times. Serve with well chilled dry Sparkling wine and celebrate life! How to make truffle popcorn! Truffle Oil - start with a little and taste regularily until you get the right amount. It can be very strong so a little goes a long way. Pop your popcorn in an air popper into a large vessel. We use a large pail so we can distribute the butter, truffle oil, salt and pepper evenly. Drizzle with ⅓ of the melted butter. Shake or toss. Repeat a couple more times. Drizzle with a small amount of truffle oil. Shake or toss. Taste and repeat if necessary. Grind salt in a spice grinder with fresh thyme infusing the salt with the thyme flavour. It will look bright green to begin with but as it drys out will take on a dried green colour. You can make a fair amount of this and store it in an airtight container for future use. Sprinkle with thyme infused salt. Shake or toss. Sprinkle with fresh cracked black pepper. Shake or toss. Enjoy! Particularly with Sparkling wine or a buttery Chardonnay. Why do these two very different items go so well together? The yeastiness of the Sparkling and the earthiness of the truffle oil marry well as well as the saltiness of the popcorn and the refreshing effervescence of the sparkling. Try it ...we think you’ll like it....alot! For a sampling of Truffle Popcorn visit us on Friday afternoons and taste it with our Blue Mountain Sparkling Brut. The Penticton Farmer’s Market is the place to be on Saturday mornings. Not only do you get a chance to catch up with friends you also get to meet the people who grow the food you enjoy throughout the season. And in the Okanagan we are fortunate to have some amazing growers. One of these local producers is Zebroff’s farm in Cawston, BC. George and Anna Zebroff have been farming organically for 40 years near Cawston B.C. Their name has become synonymous with what organics is all about. You will see their son Yuri and his wife, Brandi continue that tradition under the name of Honest Food Farm. They not only produce and sell beautiful fruit, but organic juices, jams, dried fruit, salsa, and honey. Make sure you go and try their French Kiss plums! One of our favorite staples from the Farmer’s Market is Joy Road Catering’s fresh fruit galettes. These beautiful pastries in either individual or group sizes make a great morning snack or the perfect end to your dinner party. Changing with the seasons these delicious pastries are filled with the freshest Okanagan fruits available. Their baking is made with only the finest ingredients bought at the market including certified organic flour, honey from the Similkameen Apiary, Organic eggs from their own chickens, organic unrefined cane sugar and real butter. Visit Cameron Smith and Dana Ewart at the market every Saturday but go early as they sell out quickly. The Market starts in May and goes until October and is an excellent place to take your friends or family when they come to visit. There are great buskers, lots of arts and crafts and of course no end to great food to enjoy on-site or take home and make your own authentically local meal. The Penticton Farmer’s Market started in 1991 and is believed to be the third largest farmer’s market in all of B.C. It runs three blocks long, along the North end of Main Street, every Saturday from 8:30am to 12pm. Don't forget to look for Lisa's flowers, right across from Joy Road Catering!